Slugs are a problem with many plants especially those with fleshy leaves such as hostas and asarum. Copper tape is one method of stopping slugs. Acting as a barrier, it stops slugs and snails from making their way to your plants. The barrier is said to work through a chemical reaction thats deters the slugs by giving them the equivalent of an electric shock. They turn around and look for an 'easier' way. Most types sold are adhesive types, so start with a clean dry container. You will need to completely encircle the container with tape. On timber surfaces where adhesion is not so good you can staple the tape if required. It is essential that no foliage hags down over the tape to create an alternative path. The tape will age as with all copper and change color, it still works once it changes color. We have seen a few 'decorative' ideas with patterns cut into the tape. It might be more effective to cut small 'nicks' into the lower edge of the tape to create an additional abrasive barrier. The patterns tend to just make the barrier a narrower one, not really a good idea. 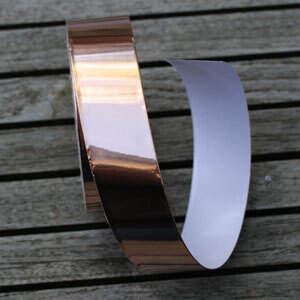 Copper tape is available for sale online and from most good garden centres.